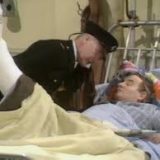 Happy Release – Fletch is in the prison hospital, where an unpleasant con called Norris, shortly to be released, has won the possessions of an elderly prisoner, Blanco. Fletch comes to Blanco’s rescue by hatching a plan involving a supposed treasure map which is handed over to Norris in exchange for Blanco’s things. 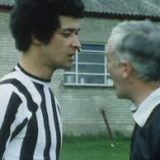 Some days later Fletch and Blanco hear on the radio how Norris, now released, has been arrested for trying to dig up the buried treasure – on a football pitch! Ways and Means – As a punishment, Fletch has to sew fishing nets with an aggressive prisoner. Fletch has a plan to talk down the prisoner from a roof-top protest after attempts by others fail. The plan works, but not quite in the way Fletch hoped.